There are many condos along the oceanfront Esplanade in Redondo Beach with great views. 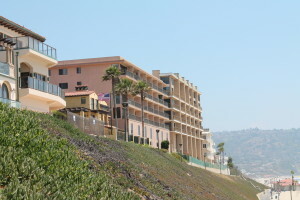 The area has a number of larger complexes on the west side of the street that overlook the beach and ocean, but due to the architecture, location, and proximity to the neighboring buildings, views are sometimes limited. This latest listing at 721 Esplanade, known as Oceania, is about as good as it gets. Sitting oceanfront in the northern side of the building, the unit overlooks a single family home (granted a spectacular single family home at 717 Esplanade for sale just south of $13.0M) . Given the location in the building, even the side bedroom (which would have no view in most buildings) has a pretty spectacular Redondo/King Harbor view. While the current price of just under $1.2M seems a bit high to us for a non penthouse unit, it’s been nicely updated, has large rooms, and offers one heck of a view. Given the location of the building, the location of the unit, and the condition, it may appeal to a number of people looking for affordable luxury. The Oceania building, along with the neighboring 727 Esplanade, sit higher on the bluff than other buildings as well adding to the expansive view. We're sorry, but we couldn't find MLS # SB14143677 in our database. This property may be a new listing or possibly taken off the market. Please check back again.